I originally wanted to do BLW with Berkeley but he just didn’t get how to chew, and had a super sensitive gag reflex so we did purees. Now he’s 9 months and ready for finger foods but I’m so scared! He still doesn’t get how to chew..he just seems to swallow everything I give him. I’ve been cutting it into teeny tiny pieces for that reason but theyr’e hard for him to pick up. I so want to try sticks of soft things but am nervous…. How did Ryan know to chew?? We got pretty lucky wit teh gag reflex, and Ryan’s only really triggered when he shoved way too food in like a weirdo. I would definitely recommend sweet potato sticks – Just cook them until they are super soft but before they brown (you can also steam them but they’re harder to grab that way sometimes) That way when it gets into his mouth, if he just gently smooshes it with his tongue, he’ll start to understand the concept. Ryan definity took a bit to understand chewing, the first few times he would just put it in his mouth, make a weird face and stop. We found that a mix of having him watch me smoosh it, put it on, a spoon and then spoon feed it before offering him the other stick of whatever was mushed on the spoon helped as well as eating with him. I would sit right in front of his highchair, take something off it and pretty much make an exaggerated show out of eating it and chewing it. It was probably funny to watch, but I’d chew with my mouth open and make a lot of chewing noises. but he’s start to imitate me, so it worked for us! If you have any other questions, feel free to ask me anything!! We don’t have a baby in our house at the present so I already forgot how it was for us back then. My last baby did BLW. She has a lot of food allergies and would refuse for so long that it was just easier to put food on her tray and let her experiment with it when she felt safe to eat it. To this day, at 2.5, she is still my messiest eater. She thinks everything should be eaten with her hands – that’s the only downside of BLW, I think, lol! It’s definitely a downside – my son is 20 months now and will literally hold a fork in one hand and eat with the other. But he’s the best eater I’ve ever met of kids his age so I’m definitely not complaining! I did BLW with my first and she took to it amazingly, she was chewing on bits of steak by 6.5 months! My youngest was a different story though – he had hyper sensitive gag reflex so couldn’t initially cope with putting things in his mouth. Not even just a spoon! We worked with a speech therapist though, and she helped to desensitise his mouth and tongue so he eventually got the hang of it. That printable would be such a good idea! I love all of the ideas and though we didn’t really do the babe led weaning with my son he would have loved those ideas! 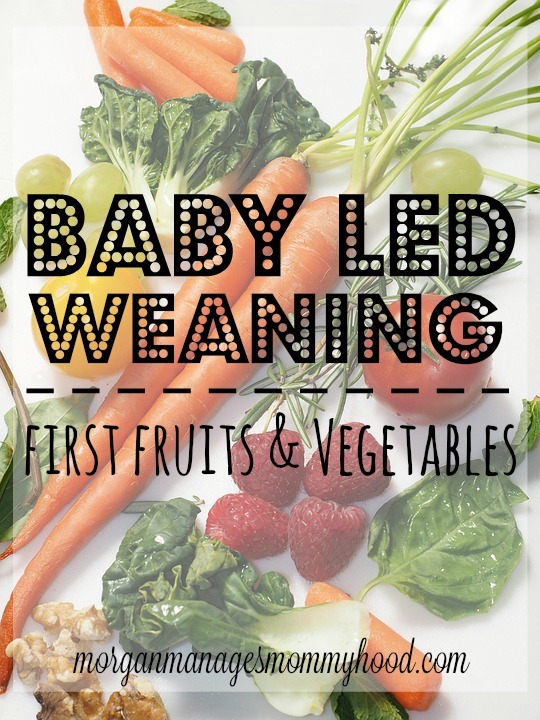 We are doing baby led weaning with pur son and we love it! At first he just seemed to be dropping it on the floor-much to the dog’s delight. He has recently turned 8 months and it is like he finally got eating. Now he eats quite a lot! He can crunch into an apple slice with only 2 teeth and he loves mealtime. Plus his fine motor skills are really improving with all that practice. He can feed himself with a spoon and is becoming far less messy at mealtimes. He loves fruit and bread or crackers but is not sold on broccoli yet. (No matter how many times he tries it.) We have also tried boiled pierogies with him and he loves eating the filling. The only downside to this method for me is that he steals things off my plate only to decide the dog would like it more. I can’t rave enough about BLW. When my son was younger people were shocked at how well honed his pincer grip was so young, and now they’re shocked at what a healthy and willing eater he is. My son still LOVES apple slices and even more, now, loves whole apples. Definitely keep trying different foods, and also reintroducing things he’s not a fan of. My son wasn’t a huge fan of broccoli until he tried it roasted! Different seasonings and textures (raw, very, very steamed, roasted, lightly steamed..) could turn him into a lover! Hahah we’ve grown to embrace it. My son is almost 2 and while he uses and enjoys using a fork, he does still use his hands. BUT everywhere we go people GASP at what a wonderful eater is and how he’s so willing to try anything at least once. Just remember, he won’t be eating with his hands when he’s 30, you know? hahah! We’ve been doing BLW. My son is a huge fan of eating. I can’t wait until he gets teeth so he can enjoy more things. Right now, at 8 months old, his favorites include fruits and chicken. Thank you, thank you, thank you! My 6 month old insists on feeding himself. I have been feeding him peanut butter toast for the last few days. I needed some inspiration and you have provided it.